An aquarium can be a focal point in any home. Whether you are an avid fish enthusiast or someone who just likes the appearance of an aquarium in their home, one of these projects is bound to suit your needs. The following aquarium plans are free. 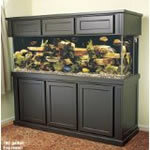 Selection of manufactured aquariums .